Permanent Court of Arbitration, ed., Multiple Party Actions in International Arbitration: Consent, Procedure and Enforcement (Oxford: Oxford University Press, 2009). Kristin Henrard & Robert Dunbar, eds., Synergies in Minority Protection: European and International Law Perspectives (Cambridge: Cambridge University Press, 2008). Yoshifumi Tanaka, A Dual Approach to Ocean Governance: The Cases of Zonal and Integrated Management in International Law of the Sea (Farnham: Ashgate Pub., 2008). Vanessa Finch, Corporate Insolvency Law: Perspectives and Principles ,2d ed. (Cambridge: Cambridge University Press, 2009). Nora Rock, Recreation Services: Law and Risk Management (Toronto: Emond Montgomery Publications, 2009). American Law Institute, Principles of the Law of Software Contracts: Proposed Final Draft (Philadelphia: American Law Institute, 2009). American Law Institute, Restatement of the Law Third, torts – Liability for Physical and Emotional Harm: Tentative Draft No. 6 (Philadelphia: Executive Office, American Law Institute, 2009). American Law Institute, Principles of the Law of Nonprofit Organizations: Tentative Draft No. 2 (Philadelphia: Executive Office, American Law Institute, 2009). American Law Institute, Restatement of the Law, Third: Employment Law: Tentative Draft No. 2 (Philadelphia: Executive Office, American Law Institute, 2009). American Law Institute, Principles of the Law of Aggregate Litigation: Proposed Final Draft (Philadelphia: American Law Institute, 2009). American Law Institute, Model Penal Code, Sentencing: Tentative Draft No. 1 (April 9, 2007) (Philadelphia: Executive Office, American Law Institute, 2009). Michael Gold, Andreas Nikolopoulos & Norbert Kluge, eds., The European Company Statute: A New Approach to Corporate Governance (Oxford: P. Lang, 2009). Jeffrey S. Lantis, The Life and Death of International Treaties: Double-Edged Diplomacy and the Politics of Ratification in Comparative Perspective (Oxford: Oxford University Press, 2009). Jann K. Kleffner, Complementarity in the Rome Statute and National Criminal Jurisdictions (Oxford: Oxford University Press, 2008). September 21, 2009 — Startling new statistics on the worldwide prevalence of Alzheimer’s disease and related dementias are being released today as countries across the globe join together in recognition of World Alzheimer’s Day. An interesting report from the Carnegie Corporation. Time to Act is the capstone report of Carnegie Council for Advancing Adolescent Literacy. “The American Psychological Association is pleased to invite you to attend a (free) PsycINFO Webinar. This 1-hour Advanced Training session will detail the coverage and selection practices, the structure of the database, and annual reloads. For date, time and registration information, please see below. – Understand PsycINFO content and structure. – Become familiar with PsycINFO record structure and indexing practices. – Learn how to use field values and limits effectively. – Know how to create precise search strategies and manage results. scholarly literature and enhance their research process. Note that APA uses Eastern time in advertising and emails about these sessions. PDT is Pacific Daylight Savings time, i.e. Vancouver time. Are you new to UBC? Want to find journal articles, books, and dissertations? Explore the UBC Library’s web page and set up VPN so you can access electronic resources from home. Find out about UBC library services and research resources and be introduced to the library’s online catalogue, subject guides and databases: Academic Search Complete, Education Research Complete, ERIC (Ebsco) and CBCA Complete. UBC has new electronic book collections — Oxford University Press e-books, Cambridge University Press e-books, Taylor & Francis e-books and Springer-Link. Explore these together with new databases such as Education Research Complete, EdItLib, Communications &Mass Media Complete & Cabell’s Directory of Publishing Opportunities. Managing your research begins with knowing what to search, how to save, store, and organize; good resources about research, and good references about writing. Get the information you need when you go to write your papers. Review some APA style basics for citations and consider citation management software tools. Fine tune your searches. Explore key tools, terms, blogs, and enhanced research features of databases such as Education Research Complete, ERIC, Education Index Fulltext, EdITLib, & CBCA Education. Consider international sources and sites for educational research. Bring your laptops (optional) and your questions (mandatory). Set yourself up to use RefWorks (create an account, import citations from databases, create a bibliography) Also tips about RefGrabit and editing output styles. Bring your laptops (optional) and your questions (mandatory). Set yourself up to use RefWorks in writing and formatting a paper. Download Write’n’Cite and insert in-text citations while writing. Bring your laptops (optional) & your questions. Baffled by StatsCan information resources? Learn how the StatsCan website is organized,what key products are available, & where to find search tools & glean meaning from catalogue numbers. You bring the food, we’ll waive the fines! 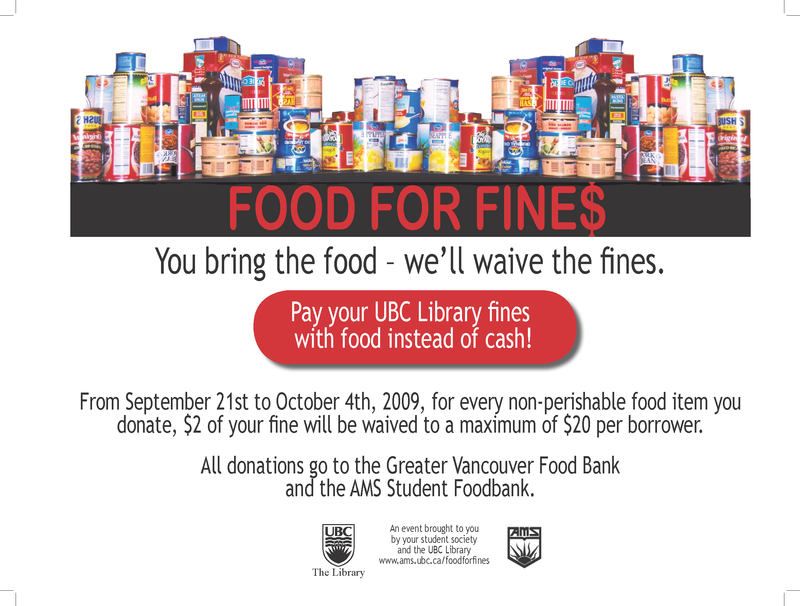 The Food for Fines program will take place in all UBC Library branches from Monday September 21st, 2009 to Sunday October 4th, 2009 ( inclusive). Acceptable food donations include any non-perishable canned or packaged food. Perishable items or anything requiring refrigeration cannot be accepted. Visit PLoS’ recently re-vamped site, read up on what the new Metrics include… and what’s coming soon!